COWETA COUNTY, Ga -- It was a shocking discovery after sheriff deputies found a four-month-old baby girl dead in her mother's bed in Coweta County. They said they found illegal drugs in the baby and two of her siblings. The children's mother, Jazmen Nicole Hazelrigs, 22, is charged with three counts of Felony Child Cruelty and Possession of Methamphetamine, but could face more serious charges if investigators determine the drugs caused the baby's death. 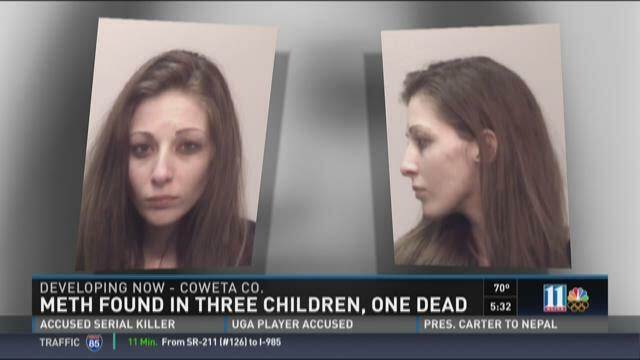 Coweta County Sherriff Mike Yeager told 11 Alive News that toxicology tests were done on Hazelrigs, her 4-month old daughter, who died, and her 2-year-old daughter and 4-year-old son. "The mother plus the three children, including the deceased infant, were positive for methamphetamine," he said. Sheriff Yeager said investigators found methamphetamine residue inside the home, including in the bed where the child was found unresponsive, lying next to her mother. "She didn't remember putting the child in the bed with her," Yeager said. "She remembered the child was in a basinet beside the bed, but then the child was found lying next to her on some pillows." Sheriff Deputies were called to 105 Crawford Circle on the afternoon of September 7, 2015 when the baby was found unresponsive. Hazelrigs was arrested on September 25th after the toxicology tests came back positive for drugs. A man who answered the door at the home Tuesday told 11 Alive's Kevin Rowson he was Hazelrigs brother. He said family members were still trying to figure out what happened. Across the street from the home Deir Hopkins said he remembers police being at the home on September 7th. "And nobody ever said anything to us so I never knew what happened," he said. Hopkins was stunned to hear what investigators found. "It's just the world we live in," he said. "It's sad, it's sad, I don't know what happened but that's shocking." Hazelrigs' two-year-old daughter and 4-year-old son are in foster homes, according to the Sheriff. Investigators are waiting for the medical examiner to determine what caused the baby's death before they consider further charges.